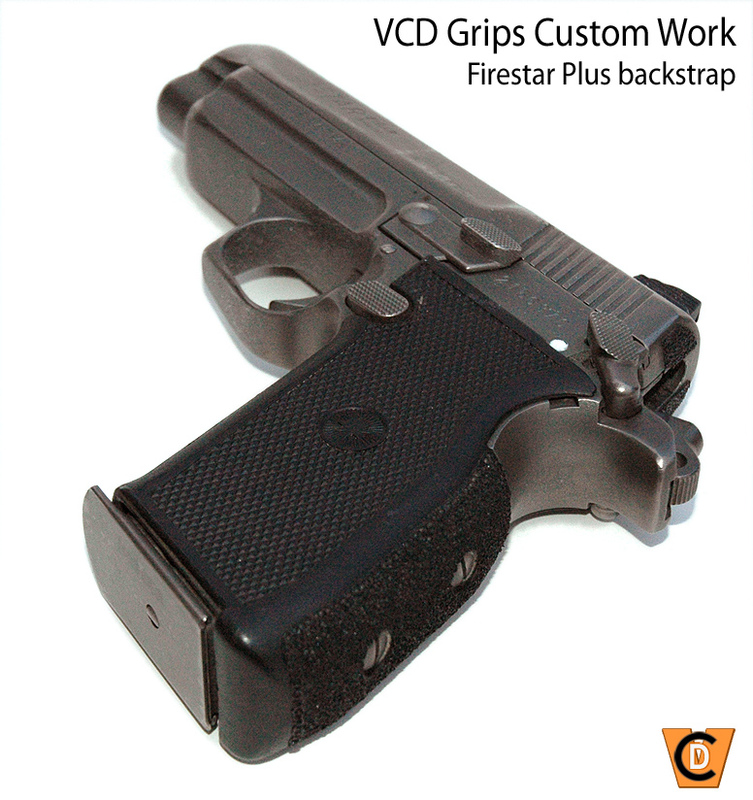 To see available products, first select the firearm on which you want to install VCD Grips. 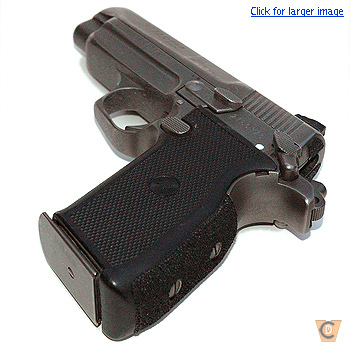 Only grips for 1911 style pistols are stocked, in three frame shapes shown below. 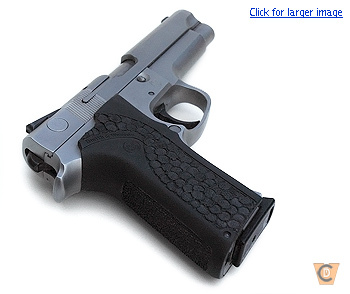 For other firearms, see our custom options. We can also do similar treatments to any plastic pistol grips, rifle or shotgun stocks, or even plastic framed pistols. To date, we have done work on customer supplied grips for Para Ordinance, 3rd Generation Smith & Wesson, Beretta Model 92/M9, 1911 officer's sized pistols and more. Please do not hesitate to contact us with ideas or questions regarding our custom work. Below are some examples of our custom work. 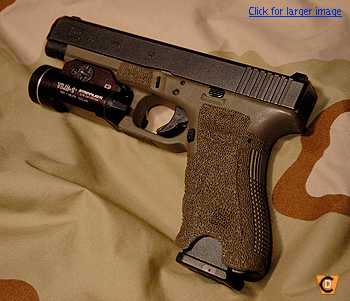 A variety of treatments can be applied directly to the gripframe of plastic-framed handguns such as the Glock, HK, M&P, and others. 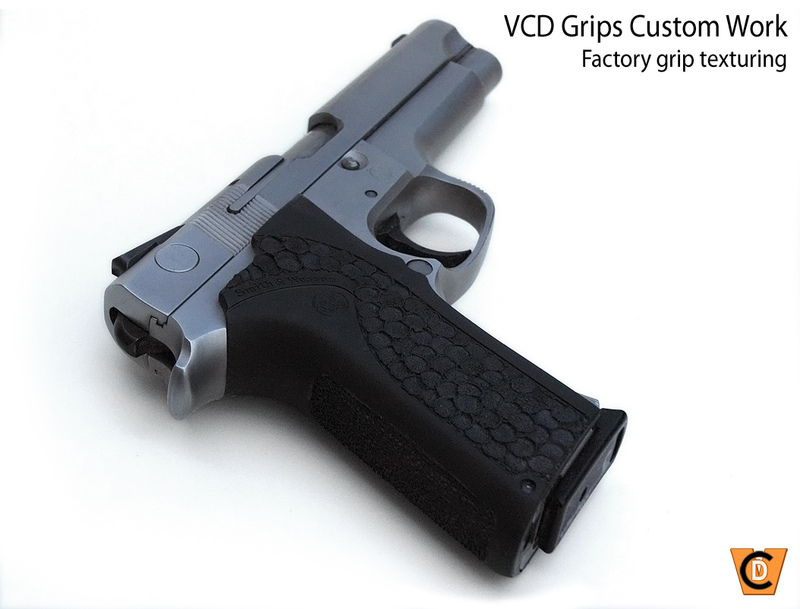 Note that VCD Grips does not have an FFL and cannot accept shipments of firearms. If you are interested in such work, you will have to arrange hand delivery and pickup of the product. Other requirements to comply with federal firearms laws may apply. While our stock items are modified from smooth panels, similar treatments can be made to many factory grip panels with texture or design already impressed. The entire panel can be textured, or as shown to the right, only portions. You may choose to only texture your trouble spots, and to leave existing designs in place for personal preference or to try to make the modification look more "as issued." Grip panels that are screwed on in two places (such as the Beretta 92/M9) are more suitable for this procedure than those that clip on, like the Smith shown here, or screw on in one place like the Browning High Power. Warping can occur. See the next item for another option for some grip styles. VCD grip treatments can be applied to as small or large an area as you wish and with your choice of several different patterns. On this gun, the backstrap stippling had worn smooth, so was enhanced with dense, small diameter texturing. As the grip was not replaceable, and was very thin, a decision was made to not texture the sides of the grip. Guns with removable backstraps, including the plastic mainspring housing on 1911 pistols, can also take advantage of this sort of spot grip enhancement. This is an excellent way to slightly improve the grip on plastic-framed pistols without the trouble and risk of handling the frame. Anything plastic can be modified to enhance the grip, such as rifle or shotgun stocks. Many enhanced stocks also change the shape, which upsets some people. 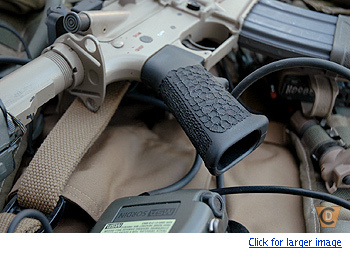 This example takes the standard, issued AR-15 pistol grip and textures all of the areas where there are molded-in grooves or checkering for a better grip in all conditions with the factory grip shape and look. 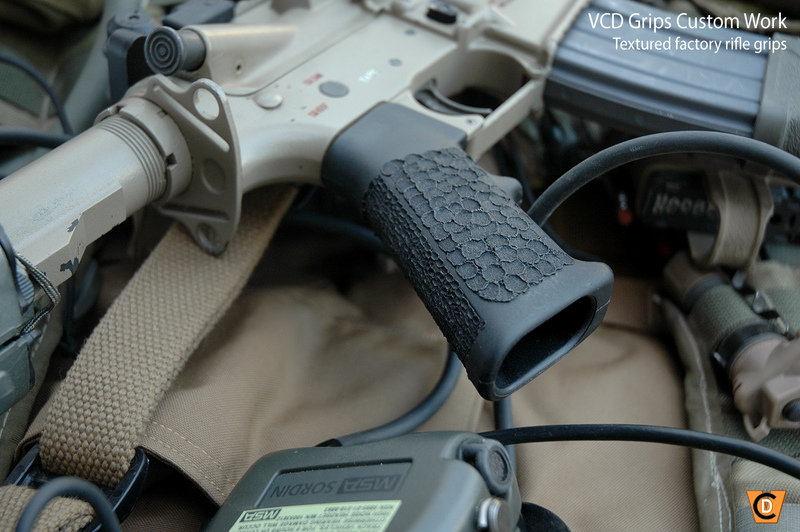 ©2008-2014 VCD Grips | For more information email us.